But Donald Trump may not see it that way. There was a proviso: The United States would do the fixing. On the day she arrived on the job at the UN Secretariat, her first (now legendary) public announcement was that she would be “taking names” of nations and people who opposed her own country. She later tailored that to say that she would respect those who respected her. Haley seemed at her confirmation hearing to believe she would have a significant, authoritative role to play in determining, for example, whether there was any “value” in the much-abused UN Human Rights Council, or competence in many peacekeeping operations, though she has said she is against a “slash and burn” approach to the UN. She also told senators that she believed Russia was guilty of war crimes in Aleppo and said sanctions on Moscow should remain because of its interventions in Ukraine, when others in the incoming administration may have been less uncompromising. Decisions of that magnitude are not an ambassador’s to make. But, in line with Trump, she would never, she said, abstain on a Security Council resolution criticizing Israel, allowing it to pass as the Obama administration had done in December when it withheld a veto condemning Israel’s settlement policies in East Jerusalem and the West Bank, letting the vote to be adopted 14-0. A strongly worded decision did emerge from the State Department on March 20, however, and it seems symbolic of what is to be expected of Haley in New York: to be a reliable defender and advocate for Israel above all else. 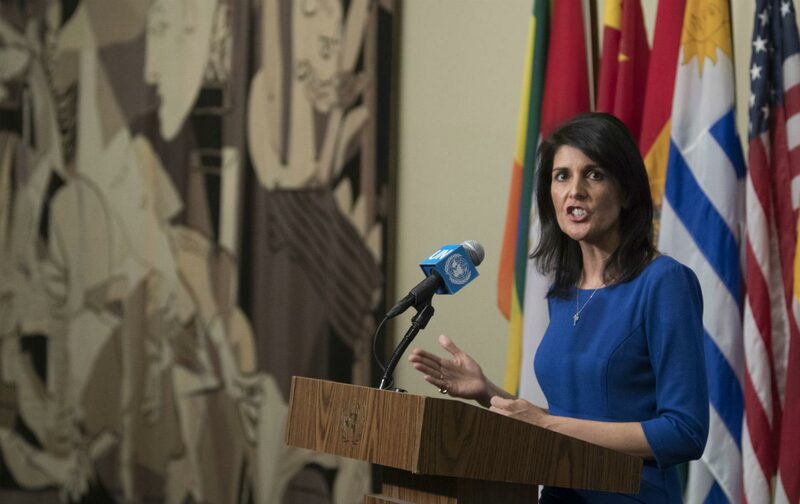 On March 20, the United States announced it would boycott a special session on Israel in the Human Rights Council until the end of the deliberations, and then join in to vote No on all its resolutions. Washington does not have veto power on that council, so its plan was to try to line up as many other negative votes as possible. Those moments are becoming the exception. A week earlier, when the Secretary General António Guterres was set to announce the appointment of a former Palestinian prime minister, Salam Fayyad, as the UN’s envoy in Syria, it appeared at first that Haley was willing to go along with the choice. But at the last minute she was suddenly overruled by the White House and forced to condemn the appointment, which was withdrawn. On Middle East affairs, she has begun working closely with the very active Israeli ambassador to the UN, Danny Danon, joining him, according to the Israeli mission, in a campaign to combat the Boycott, Divestment, and Sanctions movement against Israel, which has attracted students on American campuses and among advocates in civil-society organizations critical of Israeli policies. Haley also rushed to applaud the abrupt departure of Rima Khalaf as head of the UN’s Beirut-based Economic and Social Commission for Western Asia, Khalaf, an internationally respected Jordanian diplomat and intellectual, largely created the first Arab Human Development Report in 2002, and presided over subsequent editions. These groundbreaking reports have been incisive and critical of the Arab world’s shortcomings in social, intellectual, and economic fields. Last week, the commission headed by Khalaf produced a separate report that characterized as “apartheid” Israeli restrictions and actions governing the Palestinians. Secretary General Guterres, who was reported to be under strong pressure from the United States, withdrew the report and removed it from UN websites after Khalaf refused to retract it. On March 17 Khalaf called a news conference and resigned. Who in the White House is directing the intense pro-Israeli push at the UN? A widely held opinion is that it is Trump’s son-in-law and staunch Netanyahu friend and supporter, Jared Kushner, who, in the absence of Secretary of State Rex Tillerson in the president’s inner circle, has become the most influential voice in foreign policy, though like Haley he has little international experience beyond the Middle East. At the American mission to the UN, his backup may be Jonathan Wachtel, who was recently assigned to serve as Haley’s spokesman and director of communications, an important position as the United States takes over the presidency of the Security Council for April. Wachtel, who speaks Russian, was for the past 19 years a Fox News producer and reporter based at the UN. Stephen Schlesinger, an historian and regular commentator on the UN and international diplomacy, as well as author of Act of Creation: The Founding of the United Nations, sees Haley getting boxed in and unable to follow her own instincts based on her political experience. “She’s an ex-governor; she’s used to exercising power,” Schlesinger told me. He suggested that under current conditions, and the confusion in the White House, she may possibly not last long in this diplomatic bind. Others, including Nancy Soderberg, who with ambassadorial rank was assigned to work on Security Council affairs during the Bill Clinton administration, say that Haley has the political skills and personable approach that could help her succeed, despite her lack of international experience. Now Haley seems to be losing the space to exercise those positive qualities. Beyond the influence of Kushner, Schlesinger suggests that given Trump’s ignorance or lack of interest in the international scene, Haley might also be forced into the orbit of Stephen Bannon, Trump’s controversial radical-right adviser, who has openly said his aim is to preside over the downfall of traditional institutions. One of those institutions is the UN. Trump has already dismissed the UN as useless—“just a club for people to get together, talk and have a good time,” he says. That may not be the way it feels to Nikki Haley.